If you have a load of left over holiday money that you want to change back into Sterling then contact the experts here at Cash4Coins. We help thousands of people like you change their unwanted foreign coins and notes back into cash. Because UK banks will not change foreign coins into Sterling many people have a pocketful of worthless currency. However, we can help – if you send us your foreign coins and notes we’ll change them back into Sterling (or any other currency). So if you want to exchange Euro cents for example just send them to us and we’ll count and sort them and then send you payment – it really is that simple. To see how to send us your currency simply go to the ‘How to send us coins‘ page…. here you’ll see just how easy the process is to exchange euro cents back into sterling… why not try us out today? We’ll even collect your coins for FREE over certain weights – see ‘How to send us coins‘ for more info. If you’d like to see some of the excellent reviews we get for our great rates and customer service then take a look at our customer comments page. Here you will see the many glowing testimonials we have had for our service. If you are thinking you will not get a good deal from Cash4Coins you only have to view our comments to see that this simply is not the case. So many of our customers have been delighted with the valuation we have given them – remember, this is money that you otherwise will not or cannot use so why not put it to good use in your bank account? A lot of our customers will collect with friends and colleagues for maybe a school or local club – it’s a great way to raise some extra funds and the process is very easy. Once you send us your coins we’ll count and sort them and provide a valuation (which you can decline and have the currency returned FREE of charge) – if you like what we offer we’ll then send you payment directly to your bank (and usually in under an hour!). 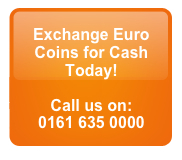 So, if you’d like to get some value from your unwanted coins and notes then exchange Euro cents with Cash4Coins today. We make it simple and convenient to exchange Euro cents so if you have lots of these tiny coins dotted around the house, collect them all together. We don’t even require you to count them out or sort them into same coin bags as we do all of the hard work for you. Our team will get back to you as quickly as possible with a fair valuation and give you all the time you need to consider that valuation. If you are happy with the price we give you, we will get to work on depositing your money in your bank account or your PayPal account. So why not exchange your Euro cents today with Cash4Coins. What have you got to lose?